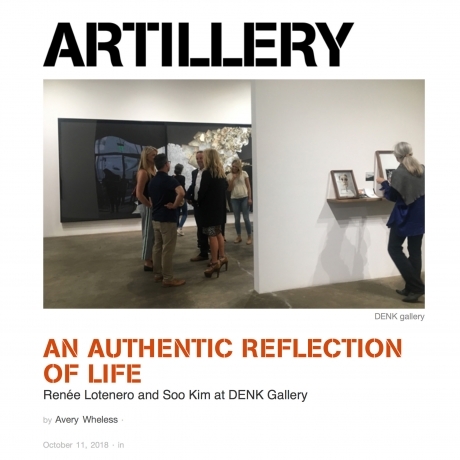 (Los Angeles, CA) - DENK gallery is pleased to present new works by Los Angeles-based artist Renée Lotenero in Sprawl. Lotenero's sculptural installation practice combines photography, the handmade, and the found to propose hybrid structures in varying states of conversion and collapse. Inspired by the living histories of site and place, Lotenero incorporates architectural elements drawn from location and invoked by memory, dissembling and reconstituting its parts into amalgams of physical fragments and facsimiles. Her sculptural interventions, though founded in the referential, border entropically on the abstract. Deliberately transient and permanently untenable, like any other living body, their lifespan is poetically balanced somewhere between artifact and ephemera. In Sprawl, Lotenero presents large-scale mixed-media 'drawings' inspired by previous site-specific works like Le Scale; a sculptural installation she had staged in the main public Piazza of a small Southern Italian Hilltop town, assembled from photographs taken of tiles from the surrounding residential interiors. The literal extroversion of private domestic space through the public re-contextualization of its hidden architectural elements touches on the plasticity that fascinates Lotenero in her de-construction of human-made structures. Her forms are compelling and indeterminate, capturing the aspirational vulnerability of human building with some pathos. Dynamically subject to the competing expansions and contractions of time and space, her works are perpetually transitioning and never static. Executed in pen, ink, gouache, ceramic and photo material, the mixed-media works in Sprawl push the two-dimensional limits of drawing. Through the sculptural activation of collage and material, the works seem to defy the confines of their frames, erupting to the seams of their external borders. As though independently animated from within, the compositions extend and spill with the propulsion of organic chaos but remain structurally balanced and cohesive, as meticulously interdependent systems. Lotenero explores the adaptive resilience of the built environment by playing with the precariousness of its boundaries and edges. Renée Lotenero lives and works in Los Angeles and Lisbon, Portugal. She earned a BFA from Art Center College of Design in 2002 and an MFA in Sculpture from UCLA in 2004. In the fall of 2008, she had her first solo museum exhibition at the John Michael Kohler Arts Center in Sheboygan. Her work has been featured in various group shows including THING: New Sculpture from Los Angeles, Hammer Museum; Almost 30, Ulrich Museum of Art, Wichita; Interstitial, Pasadena Museum of Contemporary Art; Photo and Phantasy, Carnegie Art Museum, Oxnard; Supercalifragilistic (Mistaken Landscape), La Ville Matte, Sardinia, Italy; and California Pacific Triennial: Building as Ever, Orange County Museum of Art.She was a visiting artist at the America Academy in Rome in 2005 and an ARC grant recipient in 2008. Lotenero has spent over a decade between Europe and the U.S creating work that investigates architecture in a state of flux. From temporary installations to small-scale sculptures and drawings each piece explores the opposing idea of deconstruction and construction. The work appears to be simultaneously frozen in a state of growth and collapse, conjuring notions of architectural entropy, the unfinished, and decay.